No, I explained to her; since I was small, my family has been cooking delicious chicken livers. First marinated, then coated in flour, dipped in egg and covered in breadcrumbs, pan fried chicken liver is absolutely delicious. And it’s something I haven’t eaten in years, since as Aris explained, it isn’t popular in Hong Kong. So, off I went to try to find the elusive chicken livers. Clutching the small piece of paper with ‘chicken liver’ written in English and Chinese, I bounced out of the office on the stroke of 5.30 and walked to Sheung Wan, the district about ten minutes walk from Central. 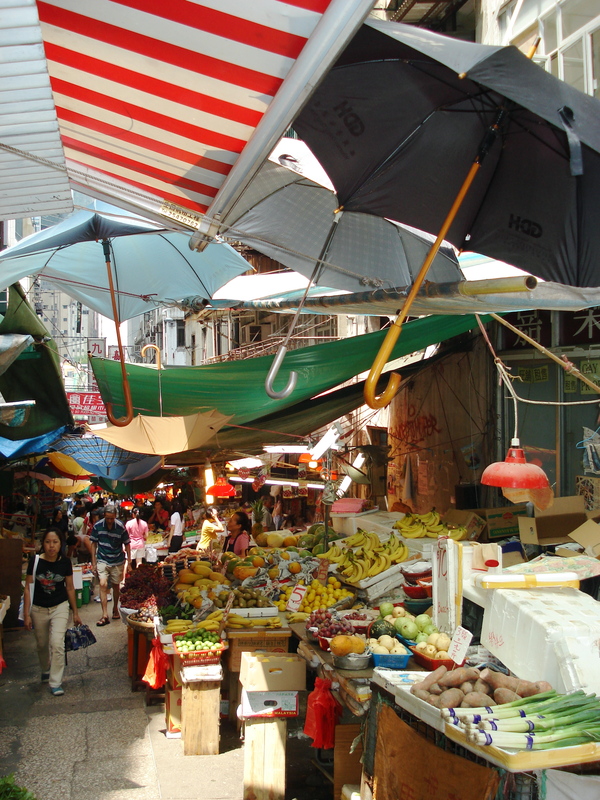 Considerably ‘more Chinese’ compared to Central, Sheung Wan has an excellent wet market, selling any and every kind of meat, fish and vegetable you can imagine. I figured if I was going to find chicken livers, it was bound to be here. The market was crowded, being a Friday night, with people buying fresh goods to cook over the weekend. Huge purple eggplants, giant ‘daikon’ (excuse the fact that I only know the name for this radish in Japanese), pigs entrails hanging from a large metal hook, live fish plucked from a styrofoam cooler, beating its body against the scale in which it has been placed, and even cats — live ones — sitting next to the store owner, its safety guaranteed by its blue collar. I went into the first place that had whole, plucked chickens hanging up by the entrance. ‘Do you have this?’ I asked in English, handing the woman the piece of paper. ‘No ah, sorry la,’ she replied with a smile. I kept walking. I found traditional noodle shops, hand made, of every variety. Flat noodles, skinny noodles, white noodles, yellow noodles. On the corner, two old women were laughing at some story. On their little wooden table, they were selling rice balls wrapped in banana leaf, traditional rice flour cakes which are served as a dessert, and a variety of other things I couldn’t even identify. The old lady on the right looked up at me. This is some Cantonese that I actually do know — ‘It’s delicious’. I smile politely and inspect their wares. She sees the piece of paper clutched in my hand, and recognises the Chinese. She motions for me to let her take a look. Her friend peeps over her shoulder and says something. I stand by wishing I could understand. The woman on the left stands up, and points me up another small alley, presumably to a shop where I can find these elusive and unpopular chicken livers. I thank her in Cantonese, to which she laughs. Up the alley, I find the shop on the right. I discover it’s a frozen meat shop. At the entrance, laying pitifully on the sidewalk, is a pig’s leg, stiff and frozen, wrapped in a crocus bag. Its little hoof sticks out, and I wonder how long until they take it inside. Inside are rows and rows of frozen balls — meat balls, lobster balls, crab balls, fish balls, chicken balls. These are common street food, either cooked in a huge vat of some savoury soup, or roasted on a flame. We go to one of the freezers, and she pulls out a big plastic bag. Finally, my chicken livers have been found. She carefully puts them on the scale, and plops my frozen livers into a plastic bag, resting the bag on top of the rows and rows of frozen lobster balls. I hand her a crisp $100 bill, and she reaches up and grabs a small red bucket, suspended on a pulley above the market. Strange place to keep cash and coins, I think, but they must know what they are doing. I thank her for the purchase, she thanks me, and I head out the door. Around the corner I walk through an area of the market I’ve never seen before. The meat shops disappear and turn into shops selling all kinds of goods. One particular shop has stacks and stacks of flat boxes, with paper models of things we use in our everyday lives. Every year, families trek into the mountains to visit their ancestral burial plots for the grave sweeping festival. The families clean the plots, pick out the weeds, remove any kind of garbage, and do a general tidying and honouring of the dead. The Chinese also believe that what you burn will float up into the heavens, providing your loved ones with things they need. Typically people burn fake paper money, but nowadays you can buy representations of pretty much anything. This shop has a box of paper mah-jong. Another box holds a paper gold watch, a nice necktie, and a man’s shirt. One box holds paper cigarette boxes, obviously for an ancestor who enjoys a good smoke. There’s a paper mobile phone, a hairbrush, even a pack of cards. I notice that the shop next door is a funky new art gallery. It’s been completely redone, a new paint job, nice glass doors, air conditioning, good lighting on the art. Seems that more and more of the modern world is encroaching on Sheung Wan, and that the smaller shops selling tofu and chicken livers are moving out. But I’m glad to see so many stores are resisting the new businesses that are moving in. Or perhaps it isn’t resistance. Maybe it’s just peaceful coexistence. I keep going through the alley, and am back down on Queen’s Road Central, the main street that runs through the business district. The market disappears into the shadows of the skyscrapers as I start to make my way home, bag of chicken livers in hand.